A plastic optical fiber is attached to a (cantilever) beam to monitor its deflection. The change in the light intensity of the optical fiber is monitored using a light-dependent resistor (LDR) and a basic voltage divider circuit. The output of the LDR is continuously measured by the ADC-16 and this simple system is able to provide real-time beam deflection monitoring with a PC. The experiment highlights the potential use of an optical fiber as a sensor for monitoring, in real time, the deflection of a structure. Students will also gain practical experience in building up a basic electrical circuit based on simple devices such a light-dependent resistor (LDR), reading resistor values, principle of voltage dividers and Ohm’s law. Students need to have an idea of how an optical fiber transmits light through its core and the principle of total internal reflection (TIR) and the effect of excessive bending on the light transmission in these light-guiding media. Secondly, students should have some appreciation of the function of a light-dependent resistor, the principles of voltage dividers and Ohm’s law. This experiment is suitable for students taking Advanced Physics and serves as a simple introduction to the practical use of optical, electronic and optoelectronic devices. Safety warning: Although it is generally safe to work with most low-power LEDs, for safety reasons, do not look directly into the LED when illuminated. A soldering iron should only be used under supervision. Figure 1 shows the experimental setup for the experiment. The experimental arrangements for both the three-point bend and tensile tests are shown in Figure 4. A standard voltage supply was used to power the light emitting diode The detector and data acquisition system consisted of a light-dependent resistor (LDR) and a low-cost commercial data acquisition system from Pico Technology which automatically records voltage changes across the LDR as the light intensity varies. The data acquisition system offers up to a 16-bit resolution analog to digital conversion (ADC) with up to 8 input channels. The resolution of the ADC system allows for the detection of voltage changes as small as 40 mV in electrical signal. A sampling rate of 2 data samples per second will be sufficient for the purpose of the experiment. The data from the optical fiber were automatically collected by the computer and displayed graphically in real time. A schematic of the beam with the bonded optical fiber sensor is shown in Figure 2. Details will be given in the following section. When the experiment is properly set up, the beam should flex about its centre with a load applied at the centre of the supports, as shown in Figure 3, where W is the applied load, dctr is the central deflection. Attach the optical fiber sensor to the beam (e.g. plastic ruler) using superglue or other available adhesive and wait for it to dry. Ensure that the bond is secure and that the sensor does not debond when the beam specimen is flexed. Connect the optical connectors to both ends of the optical fiber and couple them to the LED and LDR respectively. Ensure they are securly coupled to minimize any unwanted changes in the voltage signal due to loss in the coupling and environmental noise. Carefully put the beam on to the supports. The beam can also be secured on one end and free the other end as in a cantilever beam setup as an alternative support system to the one shown. Check that there is voltage output reading by PicoLog to ensure that the setup is correct and ready for the beam deflection test to begin. Adjust the scale of the Y-axis of the graph in PicoLog to obtain an optimum display. If you have a signal amplifier, you can also adjust the voltage level sent to the ADC. Apply a small deflection on the beam slowly and observe the change in the voltage level displayed by PicoLog. Did the signal increases or decreases when the deflection was applied? Depending on the sensitivity of the fiber, you can expect a change in the voltage of at least 100 mV for a deflection of 10 mm using the setup shown. Now release the deflection and observe the change in the voltage level as indicated by PicoLog. What happens to the signal? Does the signal return to the initial signal value? Now try with different amounts of deflection and observe the changes in the voltage signal. What do you observed? Can you explain how the circuitry works to give a proportional signal output when the light intensity of the optical fiber sensor changes? What do you think will happen to the voltage signal if the beam is deflected upwards instead of downwards as previously done? An important aspect in monitoring real-life engineering structures involve performing dynamic analyses of vibrating structures. Optical fiber sensors based on the above system represent a cost effective method to monitor a dynamic system. As a further study, the beam used in the above experiment may be subjected to a continuous deflection using a cam attached to a motor, providing a constant rate of deflection to the beam while monitoring the output signal of the optical fiber. 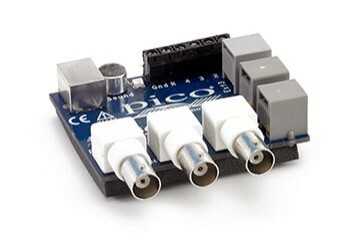 Other types of ADC supplied by Pico Technology Ltd may be more appropriate for dynamic monitoring. Contact Pico Technology for advice.